The 5-star Kajane Mua Private Villa & Mansion is located on Monkey Forest Road, just 5 minutes' walk from Ubud Market and Ubud Palace. Providing free Wi-Fi and bicycle rentals, there is also an outdoor pool and pampering spa treatments. 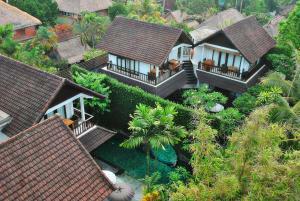 Situated in a villa, air-conditioned rooms enjoy views of the ravine, gardens or rice fields. Fitted with dark wood furnishings, they are equipped with a cable TV, iPod speaker connections and DVD player. Private bathrooms have a bathtub. Kajane Mua Private Villa & Mansion provides free chauffeur services within central Ubud area. It is an hour's drive from Ngurah Rai International Airport. An airport shuttle can be arranged at an extra charge. Guests can exercise at the fitness centre, or visit Antik Spa for a massage. The villa also provides a business centre, library and tour desk. Grilled dishes and pastries are available at Ubud HomeMade Resto. Light refreshments are on offer at Healthy Tea House. Meals can be served in rooms. Nice looking villa in Indonesia! I like the simplicity of the bedroom and comfort room. I can compare this one to Marina Bay Residences. They have the simple and minimalist approach when it comes to design.